acre range. For safety precautions, horses are only permitted to walk. You can ride with a guide or join the Riding Club for a seasonal membership which entitles you to discounts on riding packages. Once you receive your Wrangler Certification, you can ride without a guide at your own ability. 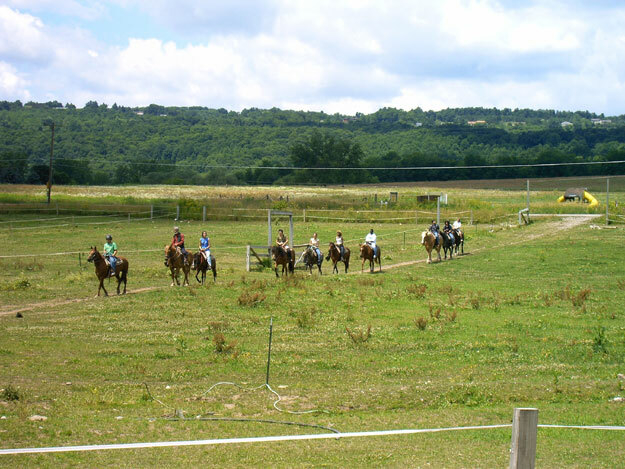 Be sure to check out some of our other packages that include horseback riding. Children under the age of 18 are required to wear helmets. We provide SEI certified helmets for minors and anyone who wishes to wear a helmet while riding. Package # TR1: Guided Horseback Ride: $35.00 - Our guides will take you for a one hour scenic cross country trail ride. Package # TR2: Private Horseback Ride $45.00: Our guides will take you on a guided private trail ride for one hour. Package # TR3: Accelerated Private Trail Ride $55.00 : For more experienced riders, we offer a trail ride with more zip, including walking, trotting, and up to a lope. You must be at least 18 years old for this ride, and in good physical shape / health. This ride is one hour long. We are always happy to take you out on our trails, even if you just made plans today! Reservations are always encouraged, but in some cases we may be able to accommodate walk-up requests. We understand many people have riding experience. For the experienced rider, guided trail rides may not offer enough freedom. We are happy to offer unguided trail rides through our Wrangler Certification program. Your experience may have come in the form of guided trail rides, where one horse follows another and does not require much from passengers. Or, you may have had lessons from a horse trained to listen to precise commands in the show ring. Or, you may have had experience with a personally owned horse; or access to an individually owned horse that has become familiar with you. All of these experiences provide you with horsemanship skills, but may have left out some important details necessary for an enjoyable and safe ride on one of our lively horses, which have all had experiences of their own. In order to offer you this unique opportunity, we need to ensure everyone who is Wrangler Certified has the skills necessary to safely enjoy our horses... So please bear with us while we assess and educate you. To learn more about our Certification program, click here.